Up to 49% Off Champagne Afternoon Tea at Marco Pierre White at the Grand Harbour Hotel (Southampton) Valid for 2 or 4 people! 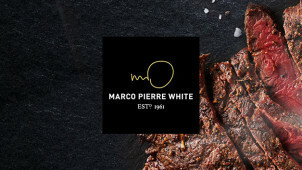 2 for 1 Mains at Marco Pierre White Steakhouse Liverpool Restaurants Valid at Marco Pierre White Steakhouse, Liverpool! Acclaimed Chef, Restaurateur and TV personality Marco Pierre White never fails to impress with his culinary creations. With 35 restaurants to discover around the UK, it’s clear that’s there’s still more to experience from this top chef. Whether it’s mouthwatering steak or a bubbly high tea that you fancy, there are five different brands under Marco Pierre White's name and there’s certainly something for everyone. Bordolino will have you dreaming of little Italy, while Mr. White’s Chophouse and will have you enjoying a quintessentially British atmosphere indeed. Enjoy even more English heritage at the Wheeler’s of St.James, while the Grill & Steakhouse and New York Italian make fine foodie destinations for couples, families and groups of friends too. Team exquisite food with something from Marco’s own wine collection, or perhaps a cocktail, and soak up the VIP surroundings that are present in each of Marco Pierre White's establishments. How do I use my Marco Pierre White vouchers? Choose the vouchers you’d like to use and click one of the offers available to use in a convenient location. Continue to book a table and be sure to check that your choices qualify for what is outlined in your chosen offer. Check out the offers’ section of Marco Pierre White restaurants to see how you can get more mouthfuls for your money. Can I read Marco Pierre White Restaurant reviews? You’ll be able to find reviews from people across the UK on the booking page. When do Marco Pierre White restaurants open? Opening hours will be displayed on each restaurant booking page. Can I buy gift vouchers for Marco Pierre White Restaurants? Whether it’s delicious food, jazzy cocktails or both that you want to gift another, Marco Pierre White monetary vouchers mean that they can take their pick. Bookings at Marco Pierre White restaurants will be confirmed via email. Use your email address and booking reference to cancel your reservation at a Marco Pierre White restaurant via bookatable.co.uk. Marco Pierre White is renowned for his exquisite cooking and passion in the kitchen; but just because you see him on TV, doesn’t mean that you can’t be part of the action. Experience fine dining at its best by using our Marco Pierre White vouchers to let you save on your bill in one of his renowned restaurants. Dotted around the UK’s hotspots, you’ll be able to treat yourself to a sumptuous steak in London or to afternoon tea in Bristol and beyond with Marco Pierre White. You can get even closer to a VIP dining experience by joining the Marco Pierre Club. Simply join the mailing list online and you’ll stay in the know about the latest dining events and tasting sessions. Plus, a special offer or two is sure to land in your inbox as well. You can’t beat a good steak, and when Marco Pierre White’s Steakhouse, Bar & Grill serves up steaks and more that are simply a cut above the rest, we know where we’ll be putting Marco Pierre White discount codes to good use. Boasting a menu that blends contemporary and classic recipes, whether you try the 35-day aged steak, a baked camembert or cheeky prawn cocktail, the flavours are sure to knock your socks off.